Trains are moderately crowded during the morning and evening hours, when employees travel to and from work. 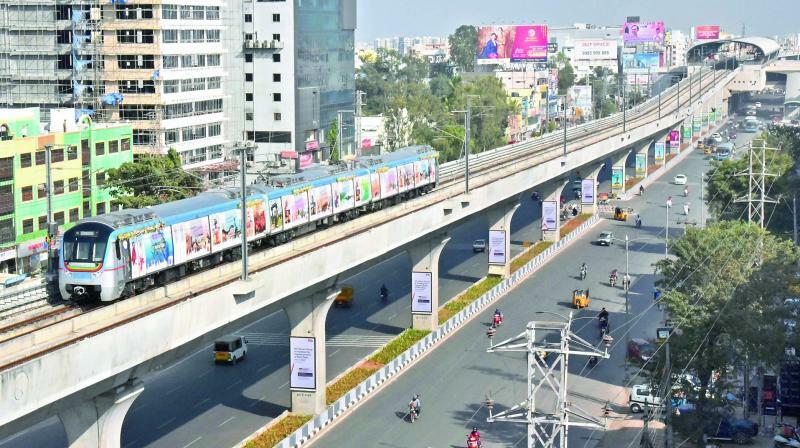 Hyderabad: The number of commuters using the Hyderabad Metro Rail (HMR) is dwindling by the day. However, K.T. Rama Rao, minister for municipal administration and urban development, says that there will be no reduction in ticket fares. At present, only about 60,000 people use the Metro per day. Trains are moderately crowded during the morning and evening hours, when employees travel to and from work. But they run nearly empty early in the morning, afternoon, and at night. The exact number of commuters is not known as there has been no official statement made by the government. The number of Metro rail service users was to have been evaluated after a period of three months from its inauguration, but that time period has now been extended to six months. L&T Metro Rail has said that last mile connectivity has to be improved for more commuters to opt for use of the metro. Some of the services launched by the Hyderabad Metro Rail, like the bike service, have few takers. Other more population options such as buses, cycles, and parking facilities, are yet to be implemented at major stations. Last mile connectivity is being developed from Miyapur Station, but other important junctions also require similar facilities. Commuters have been complaining that the metro rail fares are too high and that it takes too long to get from Ameerpet to Nagole. They complain that commute by the metro takes longer than a bike or a cab. Mr Rama Rao has said that the frequency of the trains will be increased by April, meanwhile, the number of riders is declining.